triniti is an enabling technology from Gardasoft which provides expert control, operational performance data and full networking of LED lighting for Machine Vision systems - all within a 'plug & play' environment. The Triniti technology allows for easy integration of illumination systems and LED controllers into the machine vision software via SDK and the Triniti chip. These connections are realised via standard GigE Vision protocols and software API and feature full compatibility with well-known vision software such as Common Vision Blox. A user control is also provided for designers writing their own C#, C++ oder VB.NET code. You are able to work within a familiar software environment saving you time and money when configuring your illumination. Both fixed and variable parameters are stored on the Triniti chip embedded in the illumination. In addition, the lighting is directly integrated into the software environment via Triniti SDK allowing you easy and remote control of basic parameter settings as well as advanced lighting functions such as overdriving. You have full control of your illumination and you can rapidly react to changing conditions. You want to operate your illumination system cost-effectively and for as long as possible. Data stored on the Triniti chip provides information on general characteristics of the illumination such as the ability for overdriving. In addition, the current lighting status is recorded, for example a temperature sensor may measure the actual operating temperature. Depending on the programming of the connected system, a transmitted signal may alert the user in case of overheating. It is also possible to display a warning towards the end of the lighting’s life cycle. You can avoid overstressing and thus damaging the lighting which saves you cost. You will be informed when it is time to replace your lighting. In this way, it is easier for you to plan ahead and maximise your system’s uptime. The intensity of LED lighting usually degrades over time. The reduced brightness can be measured by the camera sensor. Thanks to the Triniti technology appropriate countermeasures can be initiated in good time to guarantee uniform illumination of your test objects. Constant light conditions enhance reliability and repeatability of your inspection processes. Since you have full control of your system’s intensity level at any time, you can eliminate errors by setting tighter tolerances, because you can fall back on consistent image results for evaluation. You achieve precise test results. You are able to reduce rejects which lowers production costs. Triniti allows the storing and recalling of lighting parameters at any time. In this way, you are able to use existing settings for frequently changing test objects. You want to minimise changeover times and increase production efficiency. Thanks to Triniti camera and lighting can be operated on the same user interface. For example, you will be immediately informed of asynchronous camera and lighting trigger runs. In this case, your recordings might get too dark and won’t qualify for evaluation. But with camera and lighting on the same graphical user interface this problem is resolved. LED lighting intensity degrades over time leading to less brightness output. This might have negative impact on your application, distort the results and, in the worst case, lead to increased rejects if no readjustment is carried out. When using the Triniti technology, the camera measures the amount of light required and transfers the information to the lighting controller which automatically adjusts the lighting intensity, allowing you to eliminate intensity loss as possible source of error. Should you happen to manually adjust your lighting, you can immediately see the result in your recording. Advanced lighting options such as overdriving may strongly improve the results, but on the other hand, they carry the risk of damages due to overstressing the lighting unit. Triniti features an embedded chip which stores all relevant data of the specific lighting including information on the corresponding overdriving level allowing you control of the save operation of your lighting without having to look-up relevant information in data sheets and manuals. 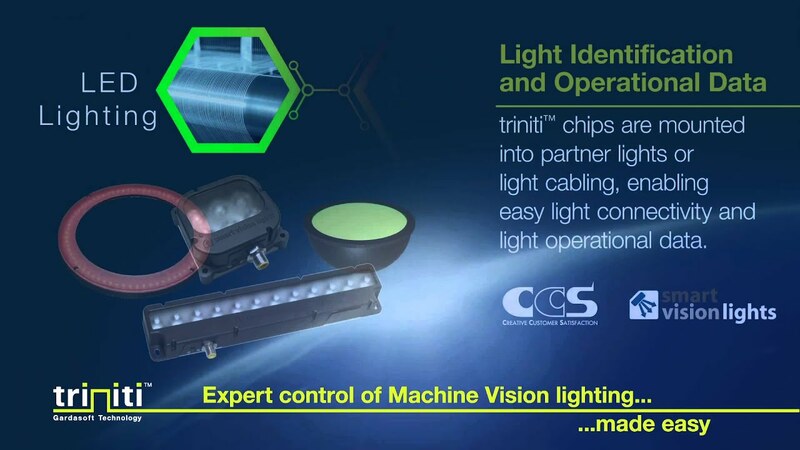 Triniti allows for easy, comfortable and simultaneous control of all lighting units within a machine vision system. Each unit can be allocated a unique name ensuring you a clear overview over the most complex lighting installations. The graphical user interface provides quick and easy access to the individual lighting units. The use of lighting controllers which can also be integrated into the Trinity set-up enables better fine tuning of lighting pulses than the mere adjustment of the camera’s exposure time which is often less flexible than the pulse setting by the illumination itself. This reduces motion blur, especially with moving objects, providing a better basis for your evaluation and thus more precise and reliable results.